With a 2500 DPI optical sensor, the OUREA may not meet the expectations of tech-savvy gamers, but 2500 DPI is more than enough for most people - in fact, some pro FPS players swear by lower DPI optical sensors. I've always been a low-sensitivity gamer, so the OUREA's lower DPI didn't bother me at all, but the optical sensor did mean that I had to be more mindful of the gaming surface I used relative to laser mice - the crinkled tablecloth I set my laptop down on had the cursor jittering even without my tremor-prone hand contacting the mouse. The OUREA sports a selectable polling rate of up to 1000 Hz. If you're on an older, weak system and want to conserve processing power, you can opt for a lower rate and sacrifice an arguably negligible amount of precision. The onboard memory allows you to store six separate profiles, each with their own macro assignments and lighting settings. The lighting options are extensive, with plenty of colors to choose from as well as solid or pulsing emission settings. 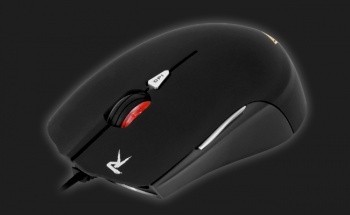 Beneath the scroll wheel is a DPI button, and two additional buttons can be found on the flanks of the mouse, which may be too few buttons for some gamers but is more than ample for me. In fact, I disabled the side buttons, as I generally do, because I have a tendency to press them accidentally. I absolutely love the ergonomics of the OUREA's ambidextrous design. It has a smaller form factor and includes a weight tuning system - something I wouldn't have expected at this price point. I don't have a large hand, and I can finger- or claw-grip this mouse quite comfortably, which makes it perfect for my FPS gaming needs. I'd love to have this same design in a laser mouse - and a laser version of the OUREA does in fact exist. Bottom Line: For $55 (on Amazon), the ARES Essential & OUREA Optical bundle offers incredible value per dollar for the budget gamer. This entry-level gaming peripheral combo has all the flash of high-end gamer gear - and even many of the features - at an almost unbelievably low price point. Recommendation: The ARES Essential & OUREA Optical bundle would make a great gift for someone discovering gaming and is a solid buy for anyone wanting to upgrade from a basic mouse and keyboard to gamer gear.